Cooling – Indoor: 27°C DB, 19°C WB. Outdoor: 35°C DB. Heating – Indoor: 20°C DB, Outdoor: 7°C DB, 6°C WB.· Sensible Cooling Conditions, Indoor: 27°C DB, 20°C WB. 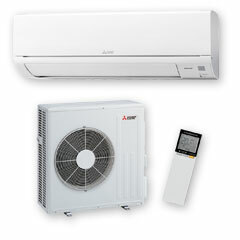 Outdoor: 35°C DB.· Dry function will not work when the room temperature is below 13°C.· Colour: Heat pump units shown may not be colour accurate, please ensure you view an actual unit for colour matching.· Maximum length is inclusive of height differential. i.e. (20m length/12m high) means the pipe can be 12m high and 8m across for a total length of 20m.